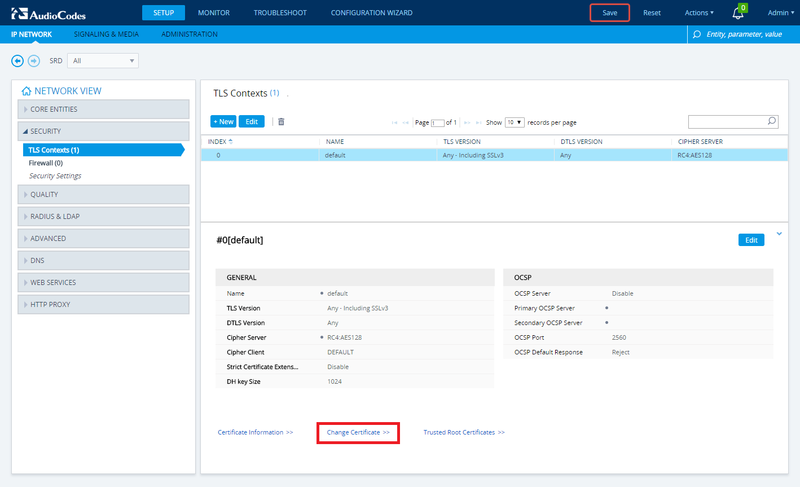 This post will be a quick guide on how to setup a TLS trunk between an Audiocodes SBC and Skype for Business. Since it is a quick guide it will not cover in detail all of the different available settings within an Audiocodes SBC or really explain what the settings I am changing actually do (I have a post on this coming soon). On a side note: people might think it’s weird that I don’t block out FQDNs, I show CSRs, I show ports, IPs, etc.. I do this because this is essentially a disposable lab environment which is entirely self-contained. There is no public DNS pointing to this lab, I destroy the VMs all the time, and really just don’t have to worry about putting this information out there. I’m also too lazy to edit all of these pictures. The first thing we need to do is get the certificate installed. In order to do this, we’ll need to generate a CSR from the SBC to get the device certificate and we’ll need to grab the root certificate as well (I’ll be using an internal CA for this). Now we’ll generate the CSR which will be used for requesting the device certificate. Now you need to fill out the CSR (only the Subject Name and algorithm name are required). I did SHA-2 for the algorithm and gave it a name which is configured in DNS (this is the name you will need to use in the topology later). Then click Create CSR. 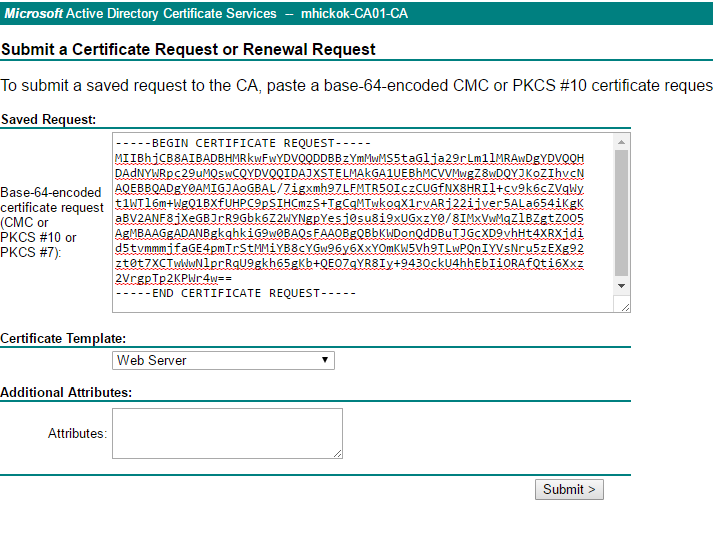 This will generate the text used for making the device certificate request. Copy everything in blue and save it for later. Now we need to obtain the root and device certificates. If you are using an internal CA, you need to make sure that it has been deployed properly and that you can use the web interface to download certificates. This will result in a .cer file which you will need in later steps. This will result in another .cer file. At this point we have both the root and device certificates which we can then import. Near the bottom of the page, click Trusted Root Certificates. 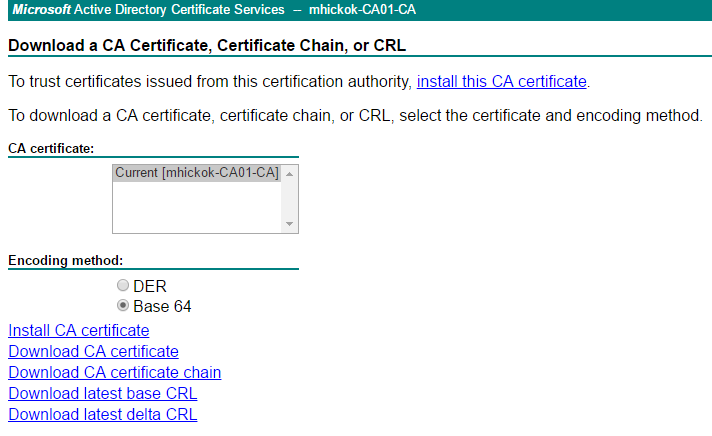 At the Trusted Certificates table, click Import and choose the root certificate that was just downloaded. A message right below will show up in blue if there were no issues with the import. Logout of the SBC and log back in. You should now see that the HTTPS session is secure and the certificate chain should show the device and root certificates. In this section I will be going through the configuration of the Skype for Business facing trunk. My networking is already setup and I have my SIP trunk configured with my SIP trunk provider (Flowroute). All that I need to do at this point is setup the logical trunk and configure it to talk to Skype for Business. Since the networking is already done on this SBC (my IP Group, Ethernet Device, and IP interfaces are setup) I can just skip right to the Signaling & Media section te begin configuring each of these items. Essentially you just work your way down the left navigation bar under Core Entities. Notice that I did not change the TLS Context for the SIP Interface. This is because I added the certificates to the existing default TLS Context. If I would have made a new TLS Context and placed the certs there instead, I would need to change this to point to the new Context. Now I will add the Media Realm which will determine the port range used for media. It’s important to make sure that the range is big enough so that you do not run out of available ports. Quick note: Since I don’t differentiate between listening and destination port for this trunk, I don’t need to specify the port at the end of the proxy as I do here (I do it out of habit). There is one more option that needs to be set for the IP Group, but I couldn’t fit it in this screenshot. Further down in the IP Group options, under SBC General, set Classify By Proxy Set to Enable. While technically not best practice, it will be fine for now (you should really have more strict rules for defining/classifying traffic). This is because we enabled keep alive to the servers in that IP group (the Skype for Business servers) and they are not responding. They are not responding simply because this SBC and trunk have not yet been added to the topology so they are not accepting connections from this SBC (or at least from this SBC on port 5067). If you are using TLS for signaling, there is a good chance that you also want to enable SRTP for media as well. If that’s the case, you just need to change a couple of settings. Keep in mind that any field with the lightning bolt on it requires a reboot of the SBC to take effect. So after changing the settings make sure to reset the device (and save to flash!). 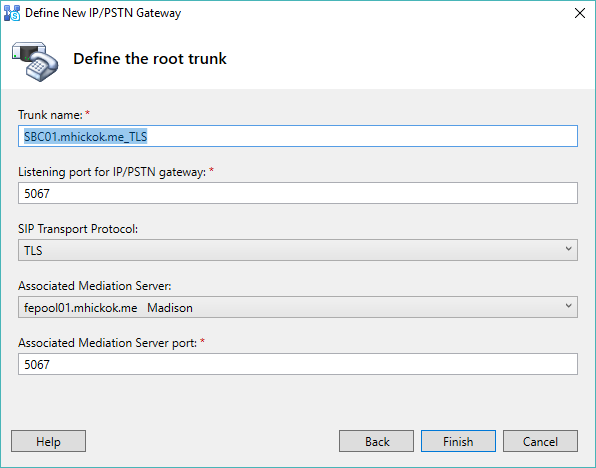 In Skype for Business, the default global trunk configuration is SRTP is required (though in the background I believe this setting is ignored if the trunk is configured as a TCP trunk in topology). If you have changed this then you may need to go to the Skype for Business Control Panel and make a new trunk configuration change for this new trunk, setting the Encryption support level to Required. You can also make it so that the SBC will require SRTP by going to Media=>Media Security and setting Media Security Behavior to Mandatory. Open up topology builder and go to Shared Components. 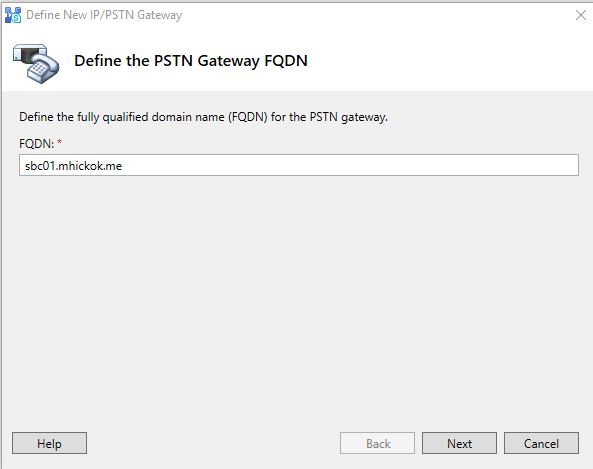 If the SBC has not yet been added as a PSTN gateway then you need to add it by right-clicking PSTN gateways and choosing to add a new one. From here, enter the DNS name of the SBC (this must match the subject name on the certificate) and choose next. On the next screen, even though it depends on you particular network setup, you will likely want to just leave the default option and Enable IPv4 and using all configured IP addresses. And finally you will be at the trunk configuration window. 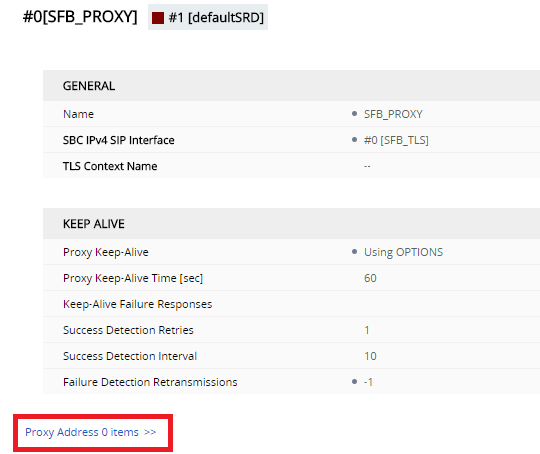 Remember how the SIP Interface on the SBC was configured for TLS 5067 and the proxies were all explicitly sending to TLS 5067 — this is the point where those settings are used. The Listening port for IP/PSTN gateway is the port which the SBC is listening on (the destination port to from SfB to the SBC) and the Associated Mediation Server port is the port which the Front End/Mediation servers are listening on (the destination port from the SBC to SfB servers). Click finish and then publish the topology. And that completes the trunk setup. As mentioned at the beginning of the post, I neglected to add a lot of important information. I didn’t explain the WAN configuration, the networking side, the required IP routes, or really explain what most of these settings do. I have a lot more posts coming on Audiocodes SBCs and will be covering each of these items. Next Post Are Common Area Phones ‘Devices’ or ‘Contacts’?